Welcome to the companion site for World of Warcraft Programming: A Guide and Reference for Creating WoW Addons! See the tabs above or the links below for the latest information affecting the book and the World of Warcraft API. Store - Buy this and other recommended books related to WoW addon programming. Reference - An expanded version of the API reference in the book that includes all changes to the API since the book's release. Chapters - Download example addons and source code, check for corrections to the book, and browse the table of contents for each chapter. Forums - Chat with other WoW Programmers! Report website problems, suggest updates, etc. Utilities - Download useful tools including Lua binaries, development addons, and more. Experiment in Lua with our online, interactive interpreter and other web-based tools. Code Snippets - Post a snippet of code here that you find useful, or browse other people's snippets. 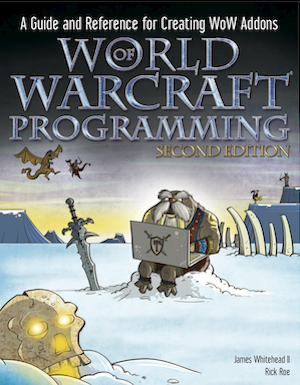 World of Warcraft Programming (second edition) has been released! You can find it on the bookshelf in your favorite store, or at a number of online retailers. As always, please report any issues with the website directly on the website forum. World of Warcraft™ and Blizzard Entertainment™ are trademarks or registered trademarks of Blizzard Entertainment, Inc. in the U.S. and/or other countries. The original materials contained in the API Reference section of this website are copyright John Wiley & Sons. Other copyrights on this page are owned by their respective owners. All other content © 2008-2017 wowprogramming.com.